It’s important to get some control over the situation. You need to make sure every cat gets the right amount and the right kind of food – especially if you have one or more cats who need a special diet. But how do you feed a hungry pack of cats? "It’s better to feed on a meal plan instead of free feeding (leaving food out all the time), because you can observe how your cats are eating, who is eating (and who is not) and it helps you to bond more with your cats," says Kari Winters, who has several of her own cats and also fosters cats for California Siamese Rescue. "In addition, when fed on a schedule, it is easier to maintain optimum weights, as fat cats won’t overeat (if supervised) and thin cats will be hungry and be more inclined to eat." "Make sure you have lots and lots of separate plates, feeding centers, etc. And separate them a lot – don’t just line them up. That way weaker, particularly older cats do not get edged out. There is always somewhere else they can go," advises John McGonagle, who breeds champion Japanese Bobtail cats. Another way to keep the aggressive cats from stealing food is simply to slow them down. "I feed 15 cats," says Karen Commings, author of The Cat Lover’s Survival Guide. "With the rapid eaters, I put their food portions into two extra bowls so I can give them a second bowl to keep them from going after other cats’ food." 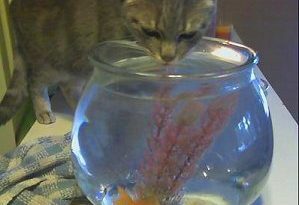 Adds McGonagle, "One way to stop the more assertive cats from eating up the best stuff is to add water to the wet food. They need water anyway, and that slows up the gobblers – a little anyway." Physically separating the cats at mealtimes is very important. "I found myself feeding cats all over the counters and on the floor and on the fridge. Everyone had her or his own spot," says Abyssinian fancier Linda Kay Weber. "I have cats of different ages and different nutritional needs," says Winters. "One of my family cats has kidney disease and one of my cats has an eating disorder. I’ve had to train them to go to different rooms at feeding time. So I have a ‘young room,’ an ‘over eight years old’ room, and a cat who has to eat by herself. Nora, the one with kidney disease, won’t eat by herself, so I put Nicky in the bathroom with her and they both eat the special food." "If you find a problem with one cat, as we have with one where fish (even as an added ingredient such as fish meal) gives him uncontrollable runs, you have to be willing and able to change everyone’s diet to accommodate the one," says McGonagle. Of course, if you’re feeding a prescription diet, first check with your veterinarian to make sure it’s OK to feed to your other cats. You must always be the food police in your multicat household. "I have to stand guard over whoever is getting a special food and fend off other cats or keep the patient there to eat her own food," says Weber. "The Abyssinians have their own ideas about rules – my rules don’t count." Special diet or not, monitoring is important to make sure all cats get their fair share and can eat without intimidation. When you switch your cats to measured, regular meals, mealtime is generally over in 10 minutes or less, so you can stand there and supervise at each meal. And finally, "Remember to tell your vet that you cannot give medicine in the food or in food treats," says McGonagle. "In the former case, you cannot completely control who eats what. In the latter, well, does the word ‘swarm’ mean anything?"